Smart, deep, quick-playing two-player games are still somewhat hard to find even in this modern explosion of great boardgames, but it’s a real market that deserves more attention. Game nights with friends are fun, but perhaps less practical when, for example, you’ve got an infant sleeping upstairs and it’s all you can do to avoid falling asleep on the couch at 8:30. So for as long as I’ve been reviewing and ranking boardgames, I’ve paid particular attention to true two-player games that play in a half-hour or so without surrendering the strategic aspects found in the best games for three or more players or games that require 90-120 minutes to play. Enter 7 Ronin, a two-player, asymmetrical game inspired by Akira Kurosawa’s Seven Samurai (a film that is being remade, again, for no good reason). First released in Poland in 2013, 7 Ronin is now out in English, and is one of the cleverest two-player-only games I’ve seen. One player represents a band of ninjas trying to occupy a small village; the other plays the seven ronin hired by the villagers to protect their land. The game plays out quickly over eight turns, with each player making moves simultaneously, with no randomness at all; the entire game is about anticipating your opponent’s strategy and minimizing inevitable losses. 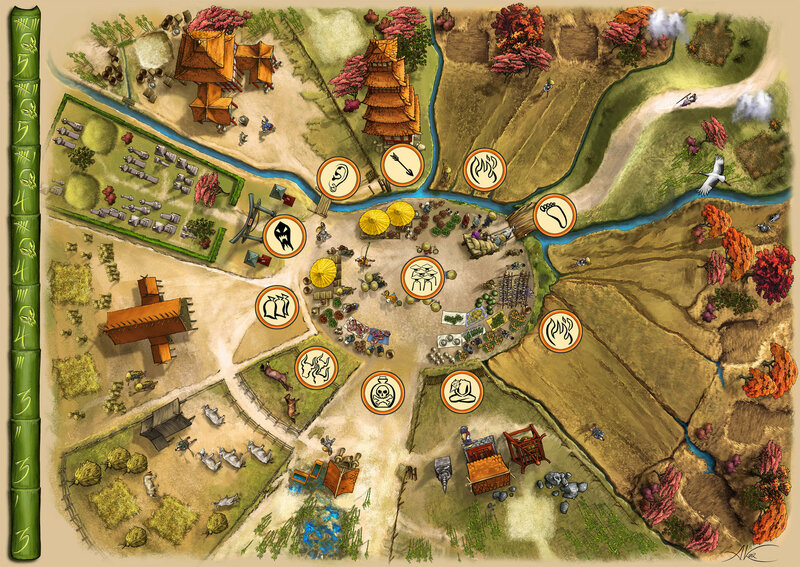 The central board showing the village has eleven areas, ten of which can be “occupied” by the ninjas, meaning there is at least one ninja token on the space and no ronin. On a turn, each player places his/her pieces on a private board showing a sketch of the village, doing so behind a screen. The players reveal their moves at the same time, shifting their pieces to the central board and resolving any conflicts. First, the ronin may get to use their special abilities, such as automatically killing one ninja or healing a wound on another ronin. Once that’s completed, then the ninjas do their damage, with each ronin able to take anywhere from three to eight “wounds” represented by ninja tokens on their cards. Once the wound spaces on a ronin card are full, that ronin is dead and removed from the game. Thus, if there are more ninja tokens on one space than there are open wound spots on a ronin card, the ronin will be out and the ninjas occupy that space on the board. The ninja player wins if s/he wipes out all seven ronin or occupies half of the town’s ten regions; the ronin player wins if s/he wipes out all the ninjas or survives the game’s eight turns. Once the ninjas occupy a space, they may also gain a special ability from that space, such as adding two more ninja tokens to their reserves or dealing one wound to any ronin elsewhere on the board. There are two Fields spaces which lack any special power, but if the ninja player occupies both at the same time, they count as three spaces toward the victory condition of occupying five areas rather than as just two. Each space has a “deployment limit” of one, two, or three ninjas—the maximum that can be sent to that space in a single turn—but the ninja player can gain the power to exceed that by placing ninjas on the eleventh space, the village green, which doesn’t count as one of the spaces to meet the victory condition but is critical to the ninja player’s chances of winning nonetheless. Thus, the game comes down to a bit of educated guesswork on where your opponent might be placing pieces on the next turn. The ronin player is going to see at least half of his/her pieces killed off, so the goal is spreading out the damage to keep a few ronin alive into the later turns. The ninja player can run out of new ninjas to play before the final turn, so wearing down the ronin early and taking control of a few valuable spaces in the middle rounds seems to be the key to winning. (The Granary, which allows the ninja player to add two ninjas to his/her reserves each turn, is especially powerful.) The ronin player can’t stop the ninja player from doing anything the latter is hell-bent on doing, given the sheer number of ninjas swarming the town, so the right strategy involves conceding one or two spaces with the goal of holding the remainder. As with the similarly-named and totally dissimilar 7 Wonders, 7 Ronin has a bit of a steep learning curve on the first play: You have to familiarize yourself with the list of special abilities for the ronin and the village areas, regardless of which side you play, to set up your strategy. However, once you’ve got those down, that’s it—the rules themselves are simple, and turns take a few minutes at most, so that you can play a full game of eight rounds in under a half an hour. I’m asked so often by readers for good “couples” games—games you can play with your spouse or partner that don’t take that long (because parents are tired people) but that involve some real thought as well. I’ve had a few standby recommendations over the years, especially Jaipur, Patchwork and Battle Line (just reissued by iello games under its original title Schotten Totten). 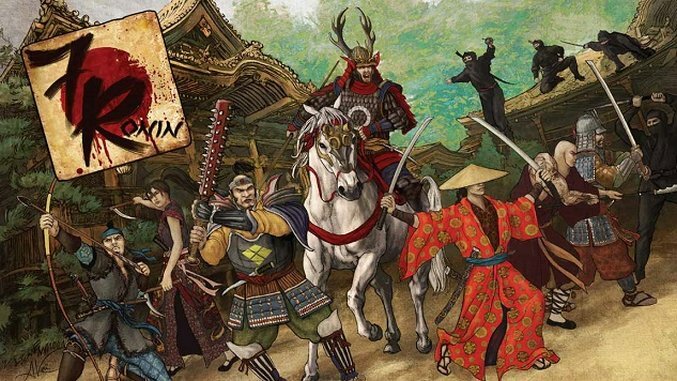 7 Ronin is even a cut above those games in the amount of strategy required, without extending playing time or sacrificing the fun of game play one bit. And, if you’re like my wife, you’ll want to play the ninja side repeatedly because you think it makes you a badass.